90 x 90 Day 6. Illustration has its limitations as a word: chief among them, a narrow quality. I have tried to suggest more capacious readings of it, drawing the etymology of illumination of shedding light, but it's an uphill battle. If I had another word, I'd use it. But the problem with narrow readings isn't confined to people outside the field. Many students come to the act of illustrating with a very limited sense of what's possible, especially in restricted circumstances. The time-honored two-color problem–back in the day, born of limited printing budgets; today, in an era of four-color ubiquity, a tactical approach–qualifies as a restriction. Exasperation with available visual means is mild compared to the frustration of confronting called-for depictive content: that's waaaay more limiting. Like, I mean, to the point of soul crushing. Say our young illustrator is handed an assignment to create a series of images about a canoe trip. Seriously? I have to illustrate a canoe trip? Just people standing around, with like, canoes? That is so boring! I can't possibly do anything with that subject! I am particularly fond of Walls and Floors for the use of negative line to define the tiles and sweeping black line to define the glue on the floor (which is totally implied; despite the chapter head, there are no walls). The yellow dividers are less effective, due to the neighboring values of yellow (8) and white (10); you can't really read fine white lines on a yellow field. Illustrator uncredited, Power Tools, section divider illustration, Better Homes & Gardens Handyman's Book, Meredith Corporation, 1957. 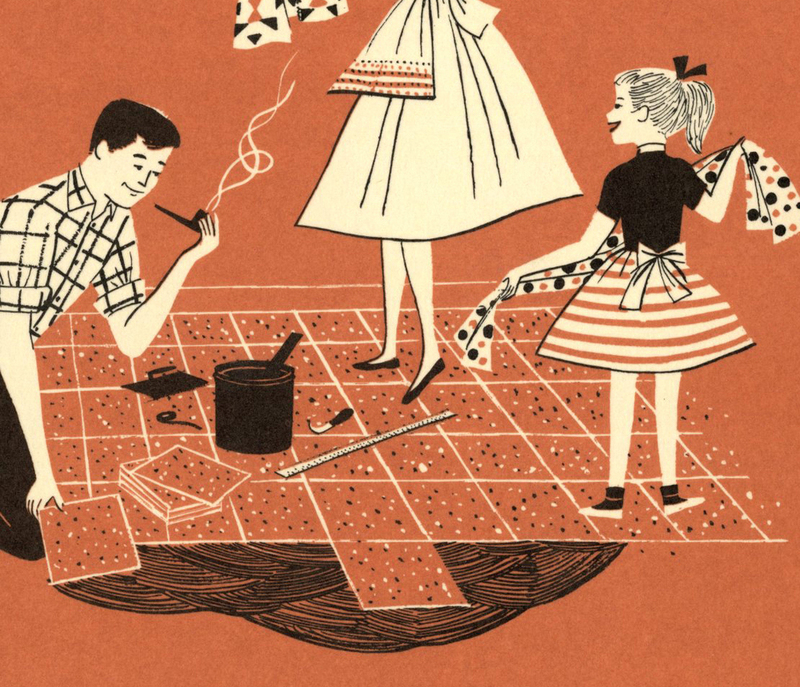 Illustrator uncredited, cover illustration, Better Homes & Gardens Handyman's Book, Meredith Corporation, 1957. Note admiring wife in housedress gazing upon hubby with bulging biceps in Richie Cunningham plaid shirt with fishing hat and pipe. Illustrator uncredited, Fastening Techniques, section divider illustration, BH & G Handyman's Book, 1957. Illustrator uncredited, Windows and Doors, section divider illustration, BH & G Handyman's Book, 1957. Illustrator uncredited, Walls and Floors, section divider illustration, BH & G Handyman's Book, 1957. Illustrator uncredited, Building Materials, section divider illustration, BH & G Handyman's Book, 1957. Illustrator uncredited, General Index, section divider illustration, BH & G Handyman's Book, 1957.